﻿ Queens Of The Stone Age should not be as big as they are. That’s not any slight on the music either, rather a) they’re a much weirder band than their biggest singles give them credit for, and b) Josh Homme is not a typical arena-rock frontman, with a background in more underground, less-mainstream-friendly strands of rock, and a contact list spanning artists far outside his own circle of influence. In more ways than one, it makes his well-publicised friendship with Dave Grohl all the more explainable. But where the Foo Fighters have frequently promised experimentation on their albums and seldom delivered, Queens Of The Stone Age have always kept their word in that department; it’s why 2013’s …Like Clockwork featured its murderers’ row of guest performers ranging from Grohl and Trent Reznor to Alex Turner, Elton John and the Scissor Sisters’ Jake Shears, and why its lead single was chosen as the stoner-prog masterpiece My God Is The Sun. So in typically maverick fashion, Villains sees Homme and co. team up with Mark Ronson behind the production desk to toss aside …Like Clockwork‘s darker undercurrents for a lighter, snappier escapist fantasy. All of those might not seem like variables that would work together initially, but with the lengths that Queens Of The Stone Age have gone in the past, they’re not exactly strangers to finding fruitful paths through unlikely circumstances. At its best, Villains comes strikingly close to that too, even though it does have a couple of issues that need addressing, none of which are with Ronson, funnily enough. He manages to keep the essence of Queens Of The Stone Age intact with rumbling, fuzzed-up guitars and a booming mix, without throwing in any Uptown Funk horn sections where they aren’t needed. There’s definitely a brand of funk going through Homme’s head, but one that’s indebted to sunburnt boogie-rock stuck in the middle of the desert. Laser-focused into the glorious pair of Feet Don’t Fail Me and The Way You Used To Do kicks the album off on its absolute strongest foot, and with the woozy hip-swing of Domesticated Animals and the feverish Head Like A Haunted House, Villains‘ top players have all the steamrolling qualities one would expect from a high-end Queens Of The Stone Age hit. That’s not always the case though, as Villains does have a tendency to run out of steam, if it gets started at all. Un-Reborn Again and The Evil Has Landed start off strong with their individual sleazy, scuzzy guitar leads only to become lost in them through their nearly seven minutes apiece, and smoother, muted cuts Fortress and Villains Of Circumstance are drained of any of that fire for a couple of plodding filler tracks. 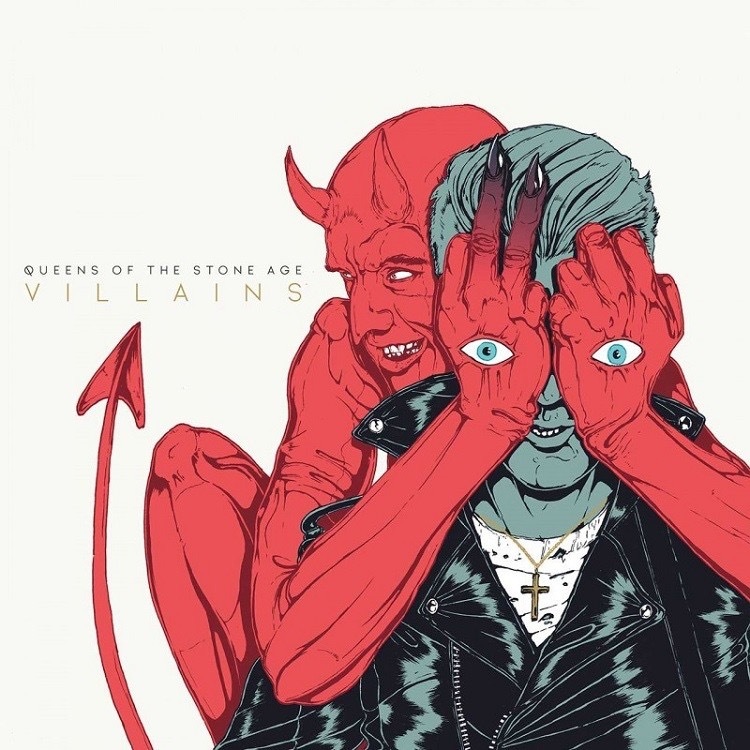 It’s a bit jarring that Villains doesn’t stick in the capacity it should; at only nine tracks there’s not much room for error, and yet this certainly isn’t Queens Of The Stone Age at their constant best. That said, having a frontman like Josh Homme can make up for a lot, and if there’s ever an example of him adhering to his own mantra of being “heavy enough for the boys and sweet enough for the girls”, it’s Villains. As always he’s as distinct in not sounding like any sort of traditional rock star, strutting between low-down swagger where the turned upper lip is practically audible and his willowy croon that proves his leathery cool still has a lot of stock in it. And with the sort of writing formed on tripped-out, heavily impressionistic imagery that has become a Queens Of The Stone Age staple, Homme stands as a captivating presence even when the album does drop away. The fact that it does doesn’t prove to be much of a problem at the end of the day, though. After all, it wouldn’t be out of the question for a band of Queens Of The Stone Age’s size and vintage to completely drop the ball this far into their career, and Villains definitely isn’t that. It may only have a handful of real gems in Feet Don’t Fail Me, The Way You Used To Do and Head Like A Haunted House, but at this stage to come out with anything of that quality at all is a rarity, and the fact that Queens Of The Stone Age are still able to pull it off says a lot. For as much as Villains isn’t another classic or world-beater, there’s a lot of gas still in the tank that’s keeping Queens Of The Stone Age going. ‘Villains’ by Queens Of The Stone Age is out now on Matador Records.